Turkic mythology embraces Tengriist and Shamanist and as well as all cultural and social subjects being a nomad folk. Later, especially after Turkic migration some of the myths were decorated with Islamic symbols. It has numerous common points with Mongol mythology and both of them were probably originated in a proto syncretic Tibetan Buddhist and nationalist mythology. Turkic mythology was influenced by other local mythologies. For example, in Tatar mythology elements of Finnic and Indo-European myth co-exist. Subjects from Tatar mythology include Äbädä, Alara. Şüräle, Şekä, Pitsen, Tulpar, and Zilant. Turks apparently practised all major religions, such as Buddhism, Christianity, Judaism and Manichaeism, before the majority of Turks confessed to Islam. Turks often syncretised the other religion into their prevailing mythological understanding. Irk Bitig, a 10th-century manuscript found in Dunhuang is one of the most important sources for Turkic mythology and religion. 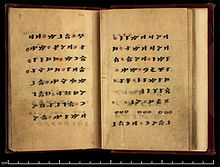 This book is written in Old Turkic alphabet like the Orkhon inscriptions. Deities are impersonated creative and ruling powers. Even if they are anthropomorphised, the qualities of the deities are always in the foreground. In the Turkic belief system, there is no pantheon of deities as in Roman or Greek polytheism. Many deities could be thought of as angels in modern Western usage, spirits, who travel between humans or their settlement and the highest deity, such as Kayra. İye are guadrian spirits responsible for a specific natural element. They often lack personal traits, since they are numerous. Although most entities can be identified as deities or İye, there are other entities such as Genien (Çor) and demons (Abasi). Kök Tengri is the first of primordial deities in the religion of the early Turkic people. He was known as yüce or yaratıcı tengri (Creator God) after the Turks started to migrate and leave middle Asia, and see monotheistic religions Tengrism was changed from its pagan/politheistic origins. The religion was more like zoroastrianism after its change, with only two of the original gods remaining, Tengri, representing the good god and Uçmag ( a place like heaven or vallhalla), while Erlik took the position of the bad god and hell. The words Tengri and Sky were synonyms. It is unknown how Tengri looks. He rules the fates of entire people and acts freely. But he is fair as he awards and punishes. The well-being of people depends on his will. Tengri worship is first attested in the Old Turkic Orkhon inscriptions of the early 8th century. Umay (The Turkic root umāy originally meant 'placenta, afterbirth') is the goddess of fertility and virginity. Umay resembles earth-mother goddesses found in various other world religions and is the daughter of Tengri. Öd Tengri Is the god of time being not well-known, as it states in the orhun stones, "Öd tengri is the ruler of time" and son of Kök Tengri. Boz Tengri Like Öd Tengri, he is not known much. He is seen as the god of the grounds and steppes and is a son of Kök Tengri. Kayra is the Spirit of God. Primordial god of highest sky, upper air, space, atmosphere, light, life and son of Kök Tengri. Ülgen is the son of Kayra and Umay is the god of goodness. The Aruğ (Arı) denotes to "good spirits" in Turkic and Altaic mythology. They are under the order of Ülgen and doing good things on earth. Erlik is the god of death and the underworld. Ay Dede is the moon god. Gün Ana is the sun goddess. As a result of the nomad culture, the horse is also one of the main figures of Turkic mythology; Turks considered the horse an extension of the individual -though generally dedicated to the male- and see that one is complete with it. This might have led to or sourced from the term "at-beyi" (horse-lord). The dragon (Evren, also Ebren), also expressed as a snake or lizard, is the symbol of might and power. It is believed, especially in mountainous Central Asia, that dragons still live in the mountains of Tian Shan/Tengri Tagh and Altay. Dragons also symbolize the god Tengri (Tanrı) in ancient Turkic tradition, although dragons themselves are not worshiped as gods. The World Tree or Tree of Life is a central symbol in Turkic mythology. According to the Altai Turks, human beings are descended from trees. According to the Yakuts, White Mother sits at the base of the Tree of Life, whose branches reach to the heavens where it is occupied by various creatures that have come to life there. The blue sky around the tree reflects the peaceful nature of the country and the red ring that surrounds all of the elements symbolizes the ancient faith of rebirth, growth and development of the Turkic peoples. The wolf symbolizes honor and is also considered the mother of most Turkic peoples. Asena is the name of one of the ten sons who were given birth by a mythical wolf in Turkic mythology. The legend tells of a young boy who survived a raid on his village. A she-wolf finds the injured child and nurses him back to health. He subsequently impregnates the wolf which then gives birth to ten half-wolf, half-human boys. One of these, Ashina, becomes their leader and establishes the Ashina clan which ruled the Göktürks and other Turkic nomadic empires. The wolf, pregnant with the boy's offspring, escaped her enemies by crossing the Western Sea to a cave near to the Qocho mountains, one of the cities of the Tocharians. The first Turks subsequently migrated to the Altai regions, where they are known as expert in ironworkers, as the Scythians are also known to have been. The Ergenekon legend tells about a great crisis of the ancient Turks. Following a military defeat, the Turks took refuge in the legendary Ergenekon valley where they were trapped for four centuries. They were finally released when a blacksmith created a passage by melting rock, allowing the gray wolf Asena to lead them out. A New Year's ceremony commemorates the legendary ancestral escape from Ergenekon. The legend of Oghuz Khagan is a central political mythology for Turkic peoples of Central Asia and eventually the Oghuz Turks who ruled in Anatolia and Iran. Versions of this narrative have been found in the histories of Rashid ad-Din Tabib, in an anonymous 14th-century Uyghur vertical script manuscript now in Paris, and in Abu'l Ghazi's Shajara at-Turk and have been translated into Russian and German. Book of Dede Korkut from the 11th century covers twelve legendary stories of the Oghuz Turks, one of the major branches of the Turkish Peoples. It originates from the pre-Islamic period of the Turks, in which Tengriist elements in the Turkic culture were still predominate. It consists of a prologue and twelve different stories. The legendary story which begins in Central Asia is narrated by a dramatis personae, in most cases by Korkut Ata himself.Korkut Ata heritage (stories, tales, music related to Korkut Ata) presented by Azerbaijan, Kazakhstan and Turkey was included in the Representative List of the Intangible Cultural Heritage of Humanity of UNESCO in November 2018 as an example of multi-ethnic culture. The legend of Timur (Temir) is the most ancient and well-known. Timur found a strange stone that fell from the sky (an iron ore meteorite), making the first iron sword from it. The word "temür, temir or demir" means "iron". 5-kuruş-coin features the tree of life. A motif of the tree of life is featured on Turkish 5 Kuruş coins, circulated since early 2009. The flag of the Chuvash Republic, a federal subject of Russia, is charged with a stylized tree of life, a symbol of rebirth, with the three suns, a traditional emblem popular in Chuvash art. Deep red stands for the land, the golden yellow—for prosperity. ^ Findley, Carter Vaughin. The Turks in World History. Oxford University Press, 2005. ISBN 0-19-517726-6. Page 38. ^ Roxburgh, D. J. (ed.) Turks, A Journey of a Thousand Years. Royal Academy of Arts, London, 2005. Page 20. ^ Dursun Yıldırım, "Ergenekon Destanı", Türkler, Vol. 3, Yeni Türkiye, Ankara, 2002, ISBN 975-6782-36-6, pp. 527–43. ^ Miyasoğlu, Mustafa (1999). Dede Korkut Kitabı. ^ "Intangible Heritage: Nine elements inscribed on Representative List". UNESCO. Archived from the original on 2018-11-29. Retrieved 2018-11-29. ^ "Heritage of Dede Qorqud/Korkyt Ata/Dede Korkut, epic culture, folk tales and music". ich.unesco.org. Archived from the original on 2018-11-29. Retrieved 2018-11-29. Walter Heissig, The Religions of Mongolia, Kegan Paul (2000). Gerald Hausman, Loretta Hausman, The Mythology of Horses: Horse Legend and Lore Throughout the Ages (2003), 37-46. Yves Bonnefoy, Wendy Doniger, Asian Mythologies, University Of Chicago Press (1993), 315-339. 满都呼, 中国阿尔泰语系诸民族神话故事(folklores of Chinese Altaic races).民族出版社, 1997. ISBN 7-105-02698-7. 贺灵, 新疆宗教古籍资料辑注(materials of old texts of Xinjiang religions).新疆人民出版社, May 2006. ISBN 7-228-10346-7. Nassen-Bayer; Stuart, Kevin (October 1992). "Mongol creation stories: man, Mongol tribes, the natural world and Mongol deities". 2. 51. Asian Folklore Studies: 323–334. Retrieved 2010-05-06. Sproul, Barbara C. (1979). Primal Myths. HarperOne HarperCollinsPublishers. ISBN 978-0-06-067501-1. S. G. Klyashtornyj, 'Political Background of the Old Turkic Religion' in: Oelschlägel, Nentwig, Taube (eds. ), "Roter Altai, gib dein Echo!" (FS Taube), Leipzig, 2005, ISBN 978-3-86583-062-3, 260-265.